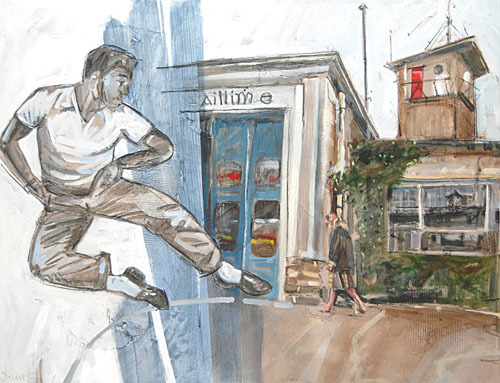 Gaillimh Dance, mixed media on canvas by Dean Kelly. No less an artist than the sculptor John Behan said these words about Galway artist Dean Kelly, whose debut solo exhibition modus operandi, will be officially opened in The Kenny Gallery, Middle Street, tomorrow at 6pm. The guest speaker will be Tom Kenny. Dean’s method involves his combining drawing and traditional methods with a loose painterly aesthetic as can be seen in such works as Gaillimh Dance and Champ. He also takes inspiration from Jean Michel Basquiat, Paul Klee, and Jean Dubuffet, the methodology of Francis Bacon and Jackson Pollock, and from graphic design, mythology, history, religion, politics, and everyday life. “The most trying aspect in this post-post-modern era is the challenge of being original,” says the artist about his work. “I don’t take solace from the idea that because all of the artistic peaks had already been traversed during the 20th century, in a way we were now ‘free’ to do what we like as artists. The fact that ‘anything goes’ now is all too often used as an excuse for presenting poor work, which jades the eye of a viewing public. “One could argue that the ideas and reputation of the artist are as important as the visual quality of the work - with this in mind our challenge is to hopefully appeal to enough people while making your own statement to make it worth doing. Pauline Bewick has described Dean’s art as “strong - very male. They are original, and he is very much himself in this collection”. Galway West TD and Labour Party president Michael D Higgins said “his paintings show a confident treatment, with a contemporary approach to traditional materials, media and modes.” Artist Kenneth Webb has described Dean’s work as “mature while still retaining an experimental innovative design”. Dean grew up in Galway city and Loughrea. He studied for a diploma in art and design in the GMIT before doing a degree in English and History at NUI, Galway. He worked with Macnas (designing many of the famous giant heads ) before becoming the exhibition coordinator with The Kenny Gallery in 2001. Modus operandi runs until Thursday October 23.